Motion Math: Fractions! 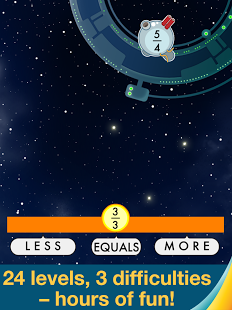 is an innovative game that teaches kids about fractions while covering a handful of Common Core math standards and UK National Curriculum. Motion Math: Fractions has kids compare fractions, place them on a number line and learn to recognize them in a variety of different forms. 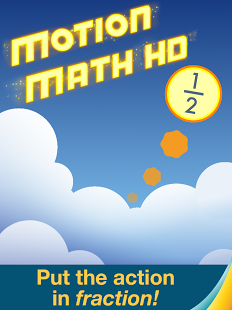 It includes three different levels, with the advanced levels tackling advanced concepts such as improper fractions and negative decimals. Through the use of such visuals as number lines and fraction bars, students can learn how to estimate and compare fractions in various formats including standard, decimal, percent, and pie-chart. 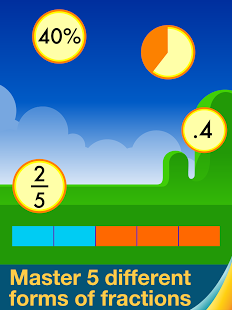 Bounce your way to fractions mastery! 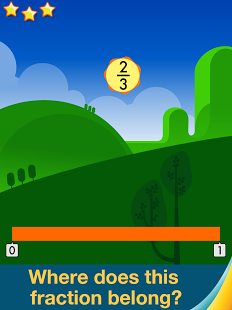 For ages 5 and up, Motion Math helps learners estimate four forms of fractions: numerator over denominator (1/2), percents (50%), decimals (.5), and pie charts. • Improved 15% on fractions test scores. 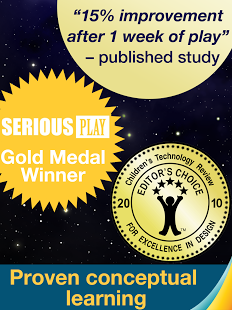 • Improved attitudes and confidence towards fractions an average of 10%. Five forms of fractions: numerator over denominator, percents, decimals, pie charts, and number line. Common Core Standards: 3.NF.2., 3.NF.3., 4.NF.2., 4.NF.5., 4.NF.6., 4.NF.7., 5.NF.6.